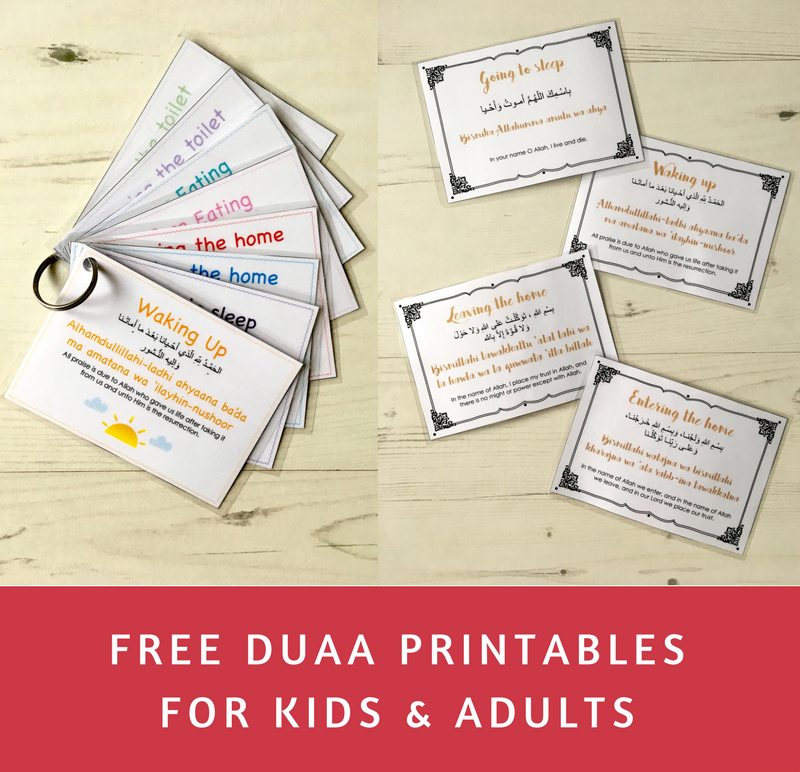 We’ve started to teach the kids duaas recently and I really wanted duaa printables for all over the home to reinforce the importance of them before/ after doing anything. 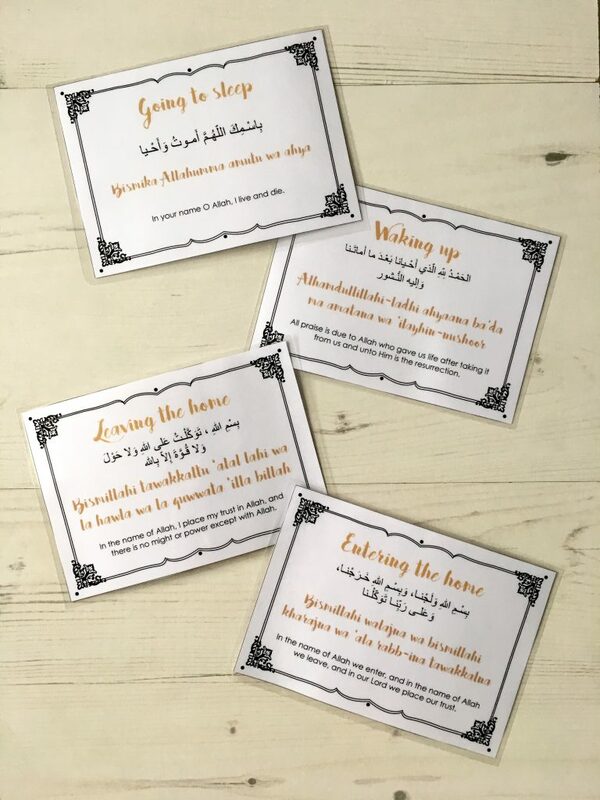 I figured if the kids saw these around the house, they would act as reminders for them to read their duaas and improve their Arabic, increase their interest for learning more about Islam and reading the Qur’an. 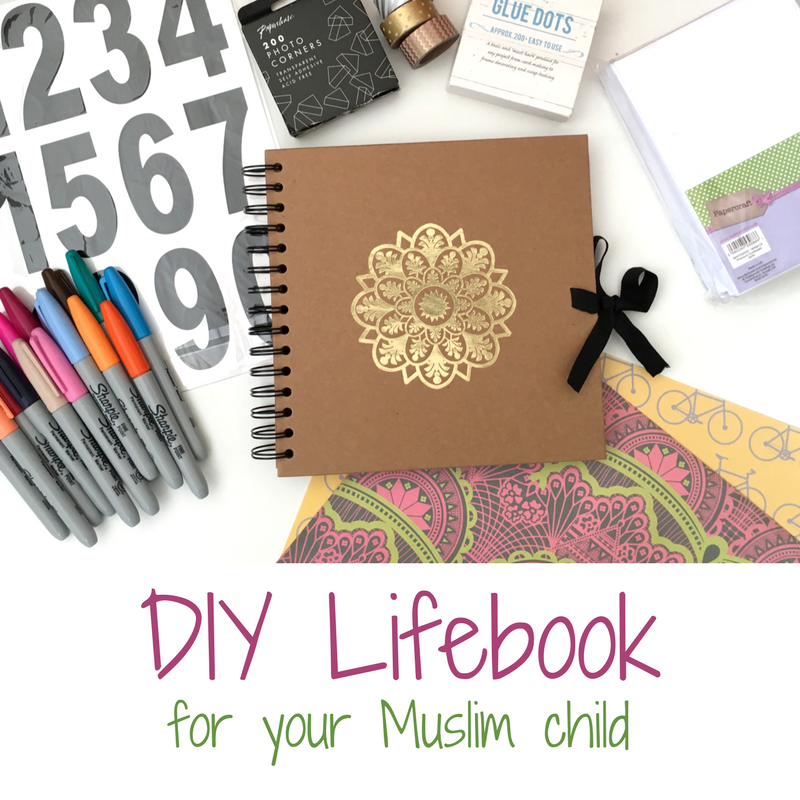 I began to look for duaa printables that I thought would work but unfortunately, didn’t find anything I liked. 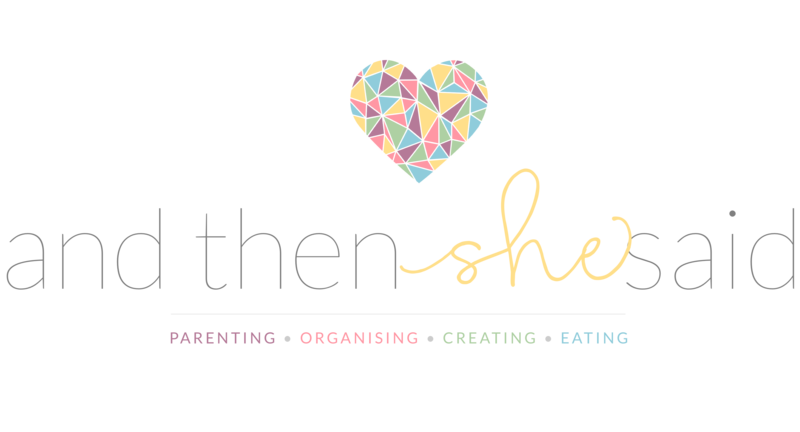 So I got in touch with the wonderful Caroline Sarri over at Mina and Moo Designs – she has a wonderful Etsy store with heaps of beautiful printables, nursery art and digital papers – to help me design what I had in mind. There are some duaas I haven’t memorised myself or ones that I forget to read. 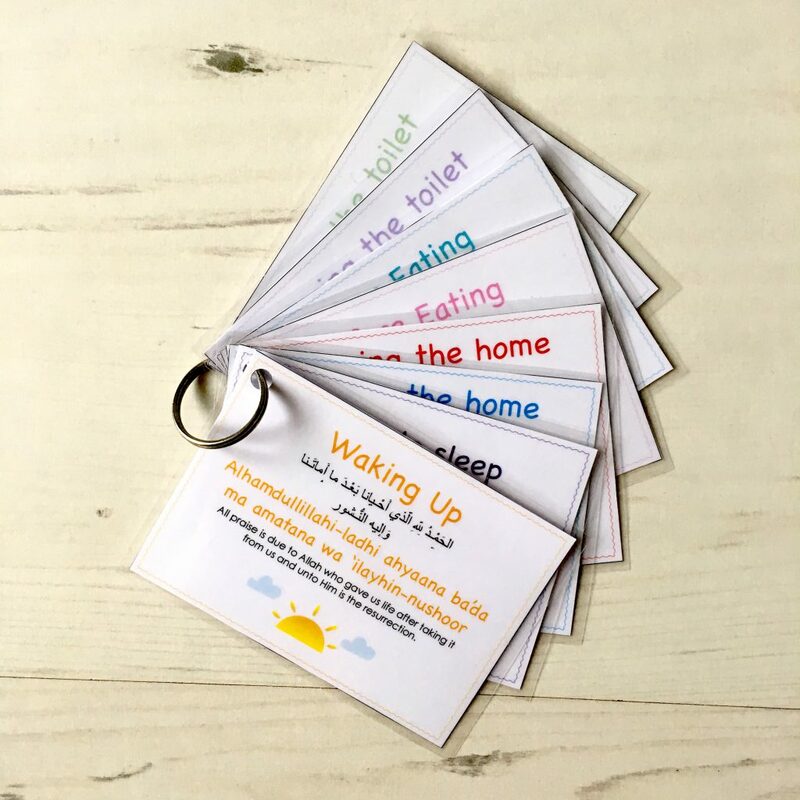 So I was keen to develop duaa printables with a more ‘adult’ design for those who want to increase their knowledge of duaas, or perhaps those who want a little reminder before they leave the home, or when they’ve finished eating, etc. 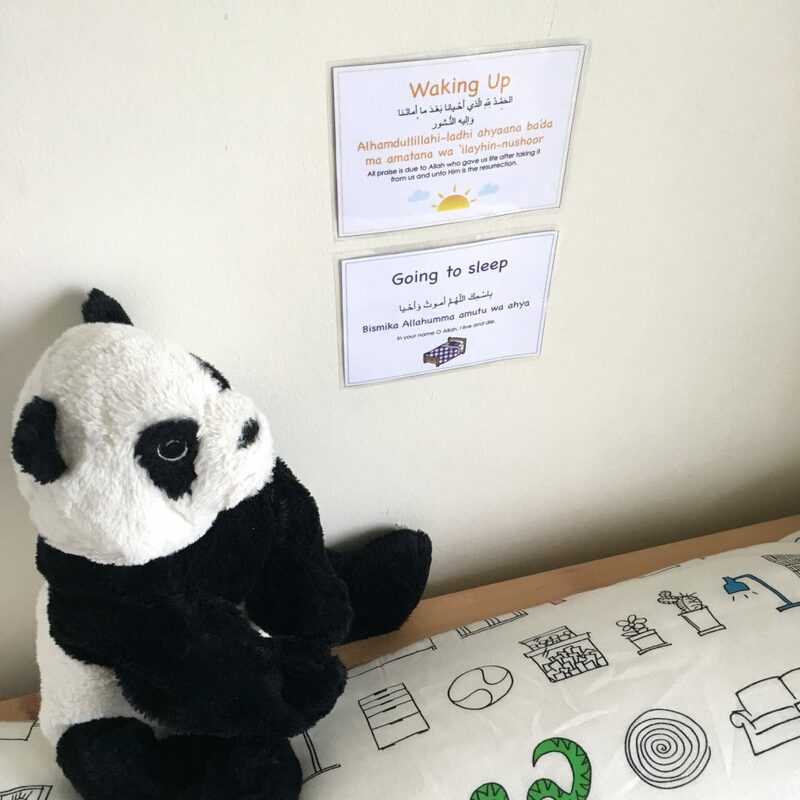 We developed two sets of prints – one that you can use whether you have children or not – and another that is designed specifically for children. 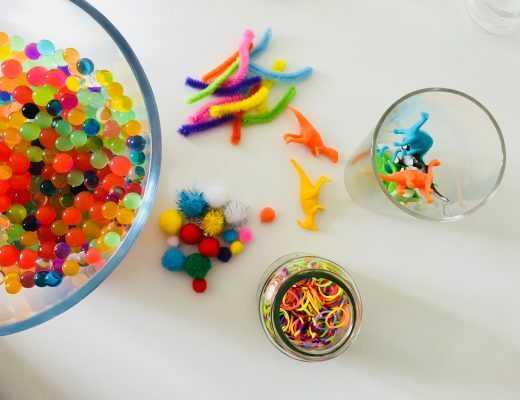 You could put these at their level around the home, or laminate them and hole punch the corners to pop them all on a ring. That way, you can travel with them and if you have older children, they might prefer it to prints on the walls. If you’d like smaller versions of the cards to pop on a ring like I’ve shown above, simply click ‘Print’ and using your print layout settings, choose 4 to a page. This usually works well in ‘Landscape’ mode – but choose whatever appeals to you. Once printed, cut them out and laminate them. Hole punch a corner and use an old keyring and there you have it! Portable duaa cards. 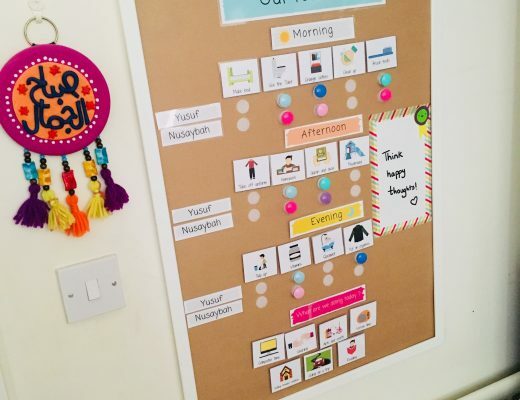 If you’d like a larger version to put up around the home like in the example below, click ‘Print’ and using your print layout settings, choose 2 to a page. Again, this usually works well in ‘Landscape’ mode. Once printed, cut them out and laminate them. We put ours up using white tac to avoid damaging the walls. Eight simple dua’as for things that we do every single day. 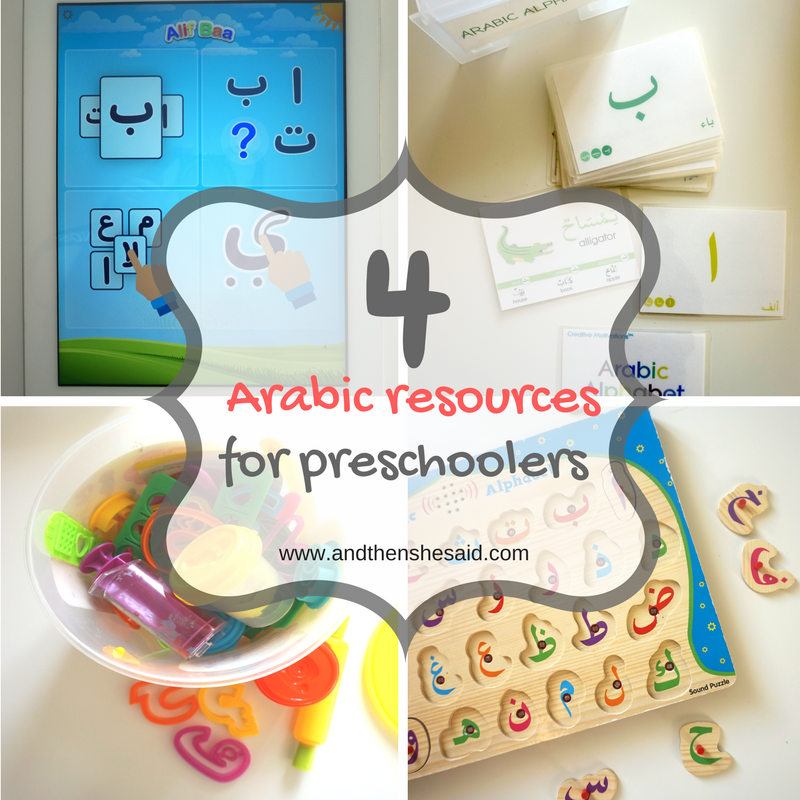 I hope that inshaAllah this resource helps your family learn and memorise these. I also hope that they become an important part of your home, as they will ours, for years to come. Please share this post with friends and family who may want to print their own. To download the free printable, add it to your cart here (don’t worry the price is set to zero!) and you’ll receive an email with the links to download them. These will never expire so you can go back and download/ print them whenever you need to! Please ensure you check your junk mail folders and/ or search for ‘Iman’ or ‘And then she said’ if you think you haven’t received the email. Jazakallah khair for the wonderful duah cards. I am going to print them soon and will show you how we are using them! I have subscribed but i never get the confirmation email. Please help! I subscribed and still can’t print! Please help! Hi Naziya, please search your inbox for ‘Iman’ and look for an email from me (that is probably in your promotions or spam folder) that will have a password with access to the printables page. The email would have been sent to you in February. As Salam Alikum sister thanks for sharing this will come in handy . 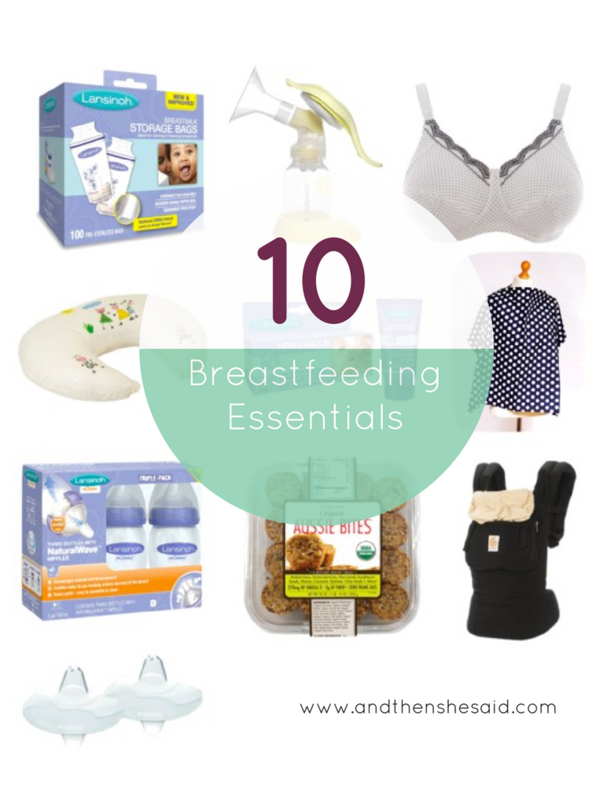 Can I post a reblog of this page on my blog? This is a wonderful idea to teach duas to kids. Its handy too. I’ll make one for my nephew. Great find. Alhamdulillah. Well done mashaAllah. This definitely fills a need. Barakallahu feek. May it weigh heavily on your scale of good. Ameen. Theae dua cards looks amazing. 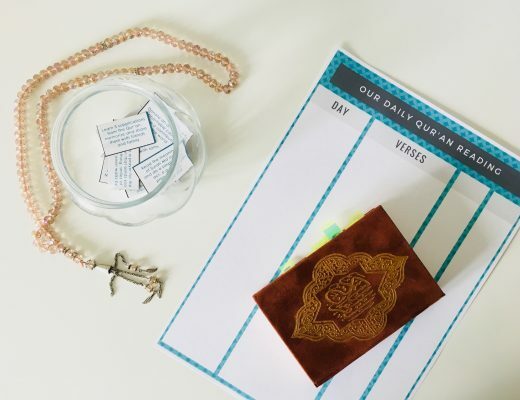 Such a great way for kids to remember duas! 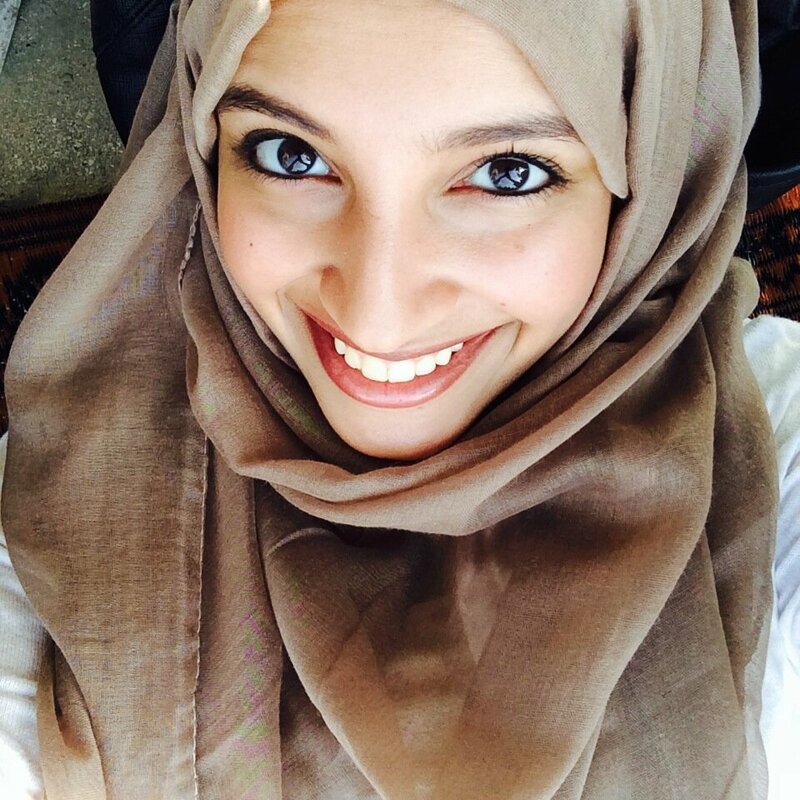 MashaAllah. 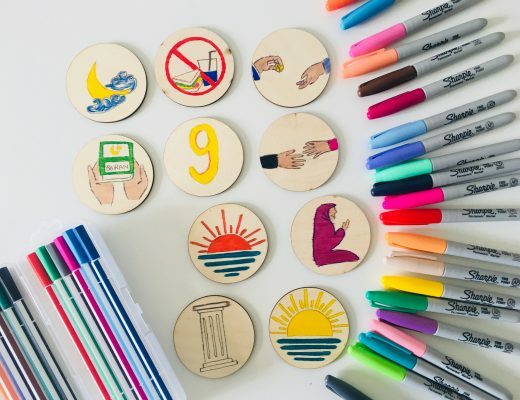 These are so beautiful and useful to help the children learn the lovely duas. I like the idea of keeping them in a ring. Waleykum Salaam Danielle, you will need to sign up to the mailing list above and you will receive an email requesting you to confirm your subscription by clicking on the button in the email. You will then receive an email with the download links for both sets of printables ? It is definitely a great way to earn hasanat..but I dont understand why,we should subscribe to your mailing list in order to get these cards. So if we don’t wont to subscribe we wont be able to benefit from this work?.. Assalam Aleykum, thank you for stopping by! 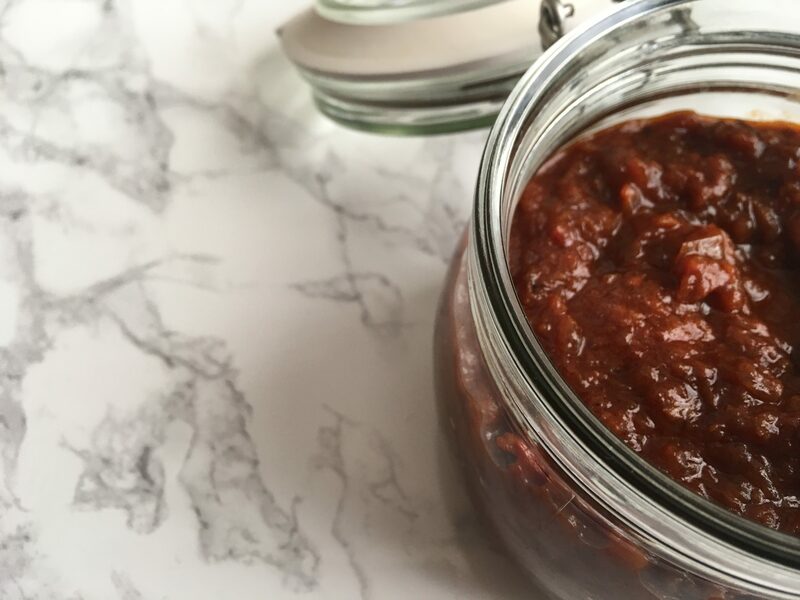 I love to keep regular readers updated with upcoming content on the blog and relevant offers/ ideas that they would find useful, through my newsletter. It is only sent out once a month, so if you’d like to sign up, you’d be welcomed 🙂 There are other resources coming up on the blog soon and you might find those useful too. There’s no active link to download these unless I’m missing something ? Please explain how to print. May I ask, what program you have used? Where did you find the little pictures/cartoon print and how did you make it? I hope you can help, i want to used them in my Ramadan planner. Wa iyyaki – I didn’t make the printables – a designer did so I’m not sure. However, Canva usually has really good graphics and you can do loads with its free version. I hope that helps inshaAllah! Waleykym Salaam Sumaira -I am looking into it and will resolve it asap 🙂 Thank you for letting me know! Same, I am not receiving any email, please help! Sorry about this Laima! I’m looking into this now and will have them over to you shortly! Salam. I have trouble getting further after filling my email. Dont recieve anything. Want these so bad…? Waleykum Salaam Pippi, you’re on the list so that’s odd – did you check junk mail and did you click on the confirmation email that you would have received just after? Assalamualaikum. I’m not receiving any emails too. Please assist. Thank you! I don’t have the printing option ? Have you signed up to the newsletter and received the email with the links for downloading? May Allah reward you for sharing this. I would just like to inform you that it has been a mistake on the dua after eating. The arabic text with arabic letters is not the same dua as the transliteration and the translation into English. Waleykum Salaam, jazakAllahu khayran for letting me know! I’ll amend the adult version as soon as possible inshaAllah! I can’t believe I didn’t spot that! Do you have the corrected version of the “after eating” Dua as I’ve just downloaded it and it still has the error. Jazaka’Allah Khair. May Allah reward you for all your efforts. Yes alhamdullilah I do 🙂 The new printables are able to download on my Free Printables page – I’ll email you a copy! Waleykum Salaam Alishah, Hotmail addresses frequently have the confirmation email go to the junk folder – could you please check if there is an email in your junk/ spam folder? Thank you. Wa iyyaki Noor! I’ll try and do a second set too inshaAllah! I have been trying to subscribe all morning but haven’t received any email. I have checked my spam/junk and all folders it could be in. Waleykum Salaam Hannah, I’m sorry – Hotmail/ MSN seem to have the most trouble with receiving emails. I’ll email you the password to access the printables resource page. Hi Fida, I have you on my list so I’m not sure why you didn’t receive a confirmation email. Could you please sign up again through here: http://eepurl.com/cGjdRX and then check your Gmail promotions tab or your spam folder for a confirmation email? Thank you. I am not able to register to your site. how to download all duas? Assalamu ‘alaykum, I have been trying to subscribe to print the Duas but it doesn’t go further. I am a member and I tried to print these duas last time for my students,that i teach in Sunday school,was unseccessful.pls help so I can do this.i need it with transliteration,and this is the only ones I find neatly written to give my students. Salaams Saleha – you can now just purchase them from the shop section (they’re still free) and the download goes straight to your inbox. JazkAllah. May Allah reward you for this! Thank you so much I will definitely be printing these. Please share some more teaching for preschoolers. Wa iyyaki and Ameen to your kind du’a. I will try to share more resources insha’Allah!